Garage and café of the National Forest Inn, around the time it opened in 1916 on the Ridge Route. Prohibition couldn't stop the '20s from roaring, even in Newhall. Locals thirsted for a good time, and Alfred Richard "Fred" Courtemanche filled the bill when he built the French Village on the east side of San Fernando Road (today the 23700 block of Newhall Avenue) just south of Newhall's main drag (Spruce Street, aka Main Street today). A French Canadian carpenter and building contractor who immigrated to California in 1915 with his wife Emma (Dault) and eventually settled in present-day West Hollywood, Alfred Courtemanche (1872-1941) had already built the National Forest Inn on the Ridge Route back in 1916 complete with a garage, gas station and white clapboard cabins. Now, with the addition in 1926 of the French Village in Newhall — which also sported cabins for wayfarers and patrons too inebriated or too amorous to drive home — both enterprises essentially served as speakeasys. 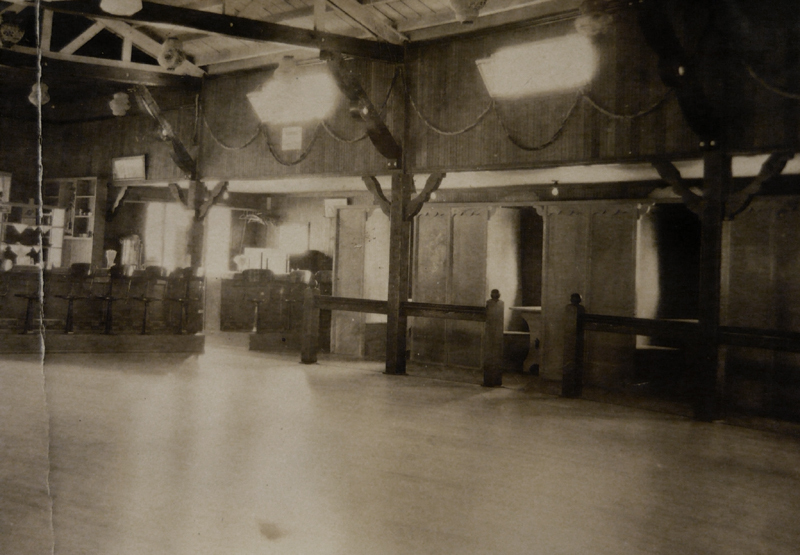 The dining room at the National Forest Inn doubled as a dance hall. Liquor apparently wasn't officially sold at either place, but BYOB was A-OK, presumably for a corkage fee. 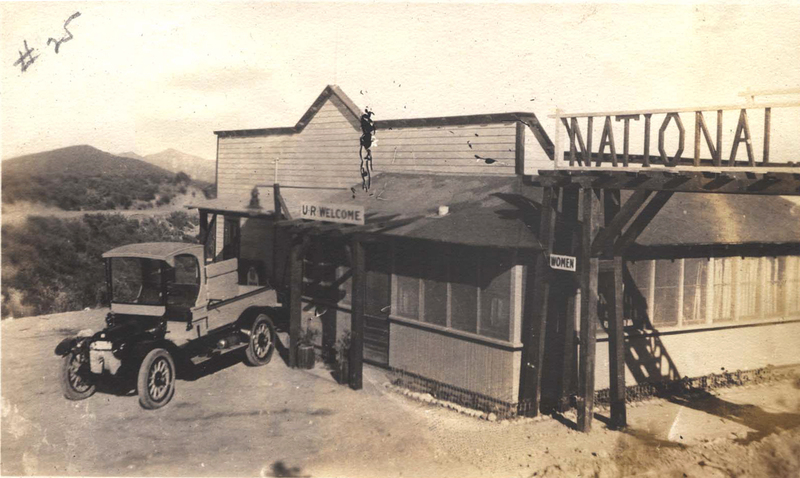 According to Ridge Route historian Harrison Scott (in his book, "Lost Hotels on California's Historic Ridge Route," 2007), "The National Forest Inn was one of the more popular placed on the old road, especially for young peole who would drive up from Newhall and Saugus to enjoy the weekend. Alfred's French Village in Newhall also had dances, and customers would bring in their own liquor which was legal to possess but not to sell. Things got plenty wild, and many young men would meet their future wives at the Village. Often the party would move up to the National Forest Inn on the Ridge Route. They would use the dining room at the Inn to set up a bar." "The Inn was a money maker," Scott writes. "Most of the time, all of the cabins and rooms that were available at the Inn were occupied." Citing information from a descendant, Scott writes that Alfred and Emma Courtemanche had 11 children, of whom nine survived to "old age." Several were elisted to help run the business. The couple sold the National Forest Inn in 1928 or 1929 to a Mr. Martin but retained ownership of the French Village, which continued to serve as a bar well after the 18th Amendment was repealed. In the 1940s, the French Village was owned and operated by C.M. and Olive MacDougall, who also owned a restaurant next to the Solemint Store — at least until C.M. was appointed to the judicial bench in the late 1940s. From their advertising in the late 1940s, we know that a member of the Cone family (of Saugus Café fame) either co-owned the nightclub with the MacDougalls or ran it for them. In December 1941, after the bombing of Pearl Harbor, William S. Hart hosted a party for servicemen at the French Village. In 1948, Newhall's finest celebrated the Fourth of July with a rollicking carnival at the French Village and dubbed the place "Slippery Gulch" for the occasion (a name that would be attached the following year and ever after to Ernie Hickson's Placeritos Ranch, later called Melody Ranch.) Recording star Tex Williams ("Smoke, Smoke, Smoke That Cigarette") moved to the Happy Valley district of Newhall in the early 1960s and ran the French Village as a nightclub called The Palace. He died in Newhall in 1985. Today, as of 2012, the main building is divided between a roofing company and an auto service shop — but it retains its original outward appearance. Incidentally, Alfred Courtemanche helped his brother, Frank Courtemanche, build the Tumble Inn ten miles north of the National Forest Inn in 1921. Frank was a stone mason by trade. Can you tell?